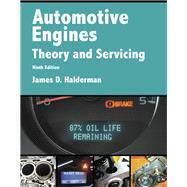 Automotive Engines: Theory and Servicing, 9/e, covers the practical skills that students must master to be successful in the industry. From shop safety and environmental and hazardous materials, to engine assembly, engine installation, and break-in, readers learn the specifics of automotive engine rebuilding, machining, and repair in a new edition of the text long-recognized as a leader in the field. Formatted to appeal to today's technical trade students, Halderman uses helpful tips and visuals to bring concepts to life and guide students through the procedures they'll use on the job.